Is there something in the water in central London? 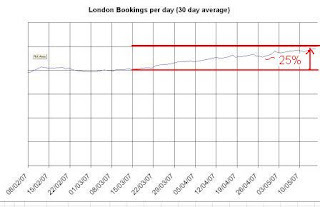 Our 30-day average bookings-taken-per-day metric has leapt nearly 25% over the past month or so (see graph; y-axis units hidden, to retain a modicum of commercial confidentiality). It hasn't taken us completely by surprise, we have been doing one or two quiet little bits of new marketing, but it is pretty amazing, nonetheless. I like this post. It has lots of exciting things that would happen. I’ll visit this site for updates and new posts. Interesting stories are very nice to read.